So, Kale. I like it, always have, but honestly I tend to favor Collard Greens (woot!) cause they are much cheaper. But I was feeling kale-ish, and bacon-ish, and I wanted something creamy and awesome to end with. Normally I wold throw a big handful of feta in, but I am currently eating dairy free. Soooooo, whats creamy and delicious? Poached egg yolks, that’s what. Thus, we came to kale+bacon+eggs. It’s filling, because the kale is cooked slowly with the water squeezed out, so that you almost have “reduced kale” by the end. So serve a little for brunch, or a lot for dinner. The kale takes a minute, so get a large pot of water boiling first. Trim the stalks, then blanch quickly once water is boiling, about 30 seconds-1 minute until leaves are a vibrant green. Drain, then rinse with cold water. Let cool. Fry the meat of your choice until crispy and the fat has rendered. While the meat cooks, chop/tear the kale into smaller pieces- manageable for a mouthful. Working with a handful of kale at a time, squeeze out the excess water and set aside. Remove the cooked meat to a plate and drain off grease. Fry the onion until lightly caramelized, then add the garlic, herbs, and about 1 teaspoon salt and stir to combine. Add the water-less kale, and turn the heat to low. Cook 25-30 minutes until kale is getting crispy and stems are tender, stirring occasionally. While the kale cooks, tear bread into crouton sized pieces. Toast lightly, then toss with olive oil, salt, and pepper. Next, get to work on poaching your eggs. Bring a large saucepan of water to a simmer, and add 1 Tablespoon white vinegar and a pinch of salt. Gently break the eggs into the simmering water, turn off the heat, and let sit for 4 minutes 30 seconds. Remove from the water to a paper towel to dry. 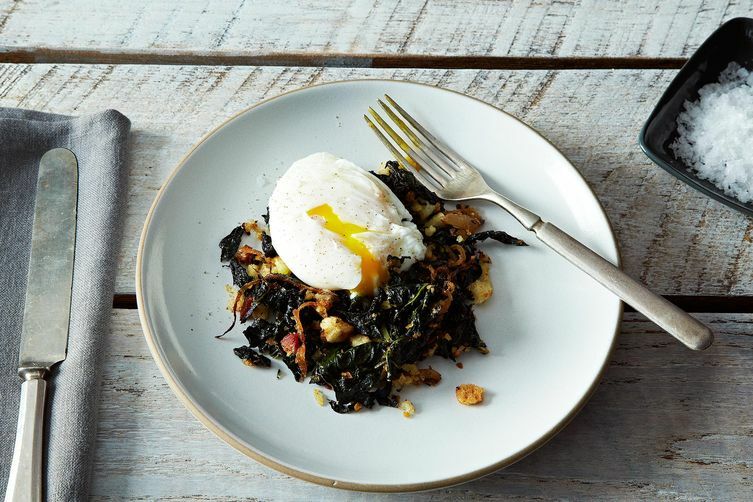 To serve, finish by tossing croutons and bacon pieces back into the kale, then place poached eggs on top. Happy Cooking!